Upon our arrival at the airport near Kuta, we went straight to Ubud, which we used as a base for the first five days of our honeymoon. Most of that time was spent within Ubud itself, though we dedicated one day doing an eight-hour circuit to various sites in central and southern Bali. (You can see this day trip by following the lighter red dotted line on the map.) Starting that morning in Ubud, we traveled to Bedulu to see the ruins of Goa Gajah and Yeh Puluh, then drove north to the royal complex of Gunung Kawi. From there, we backtracked to Ubud and continued west to the Mengwi royal temple. Our next stop was the fantastic sea temple of Tanah Lot. After lunch near the temple, we continued down through Denpasar and Kuta to the Bukit Peninsula, home to the Ulu Watu sea temple. Before returning to Ubud, we stopped briefly to enjoy the beach at Jimbaran Bay. 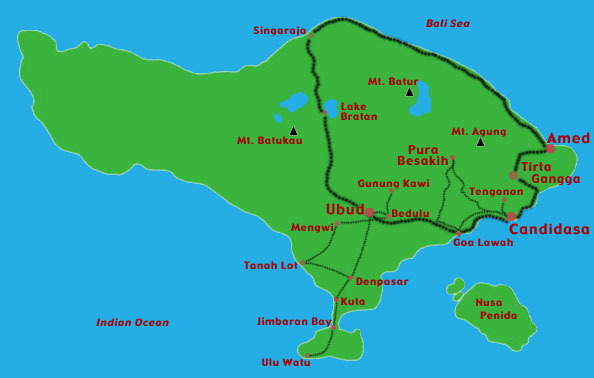 After our initial stay in Ubud, we began our major circuit around the island. Driving east to Candidasa, we used that city as a base to explore the small village of Tenganan and Pura Goa Lawah (The Bat Cave Temple) before driving north up the slopes of Mount Agung to Bali's mother temple, Pura Besakih. Departing Candidasa after three nights, we headed north for a night in Tirta Gangga, which we used as a based to explore the region's beautiful rice paddies, valleys and villages. From there it was a short drive to Amed, along the northeast coast, which served as a perfect place to relax for another three nights. From Amed, we drove northwest along the coast until arriving at Singaraja, at which point we headed south along a steep, winding road up into the central mountains. Here, we visited Lake Bratan and its beautiful lakeside temple before returning to Ubud for our last four nights of the trip.